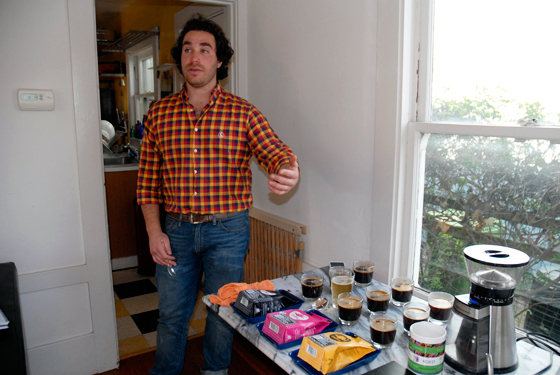 Keith Schuman, Co-Founder of Azahar shares the story behind Azahar Coffee and sets up a cupping. I like coffee. A lot. In my family, coffee is second beverage of choice after water. Depending on the time of day, sometimes it’s first. And not wimpy coffee either. I grew up watching my dad drink MUGS of ESPRESSO. But until a few years ago, and especially since moving to the Bay Area, I hadn’t given much thought to what goes into getting the muddy water into my mug. I was only concerned with it being delicious and giving me an energy boost. The 70s through the 90s saw a retrospectively titled “Second Wave” of coffee with Peet’s, Starbucks, and the whole Seattle scene nudging us out of the conformity that was Folgers and Taster’s Choice. Already the idea that coffee can be appreciated for its nuances and flavor profiles, as well as the origin and production of the coffee, was being highlighted. Coffee no longer just tasted like coffee. It tasted like red berries, hazelnut, oak, and caramel. Just like wine, the origin of the bean and its effect on the end result were being considered. In addition, the sourcing of the coffee and the company’s relationship to the growers was highlighted as an attribute almost as important as taste. Then, there’s the Third Wave, the era of coffee we are in right now. And anyone in the Bay Area would have a hard time missing it with our neighborhoods housing the likes of Blue Bottle, Ritual, Sightglass, Caffe Trieste, and Four Barrel. (Or if you’re in other states, perhaps it’s Stumptown, Intelligentsia, or Counter Culture.) The Third Wave is made up of independent roasters who view coffee as an artisanal ingredient. There is even a stronger focus on sourcing (now probably equaling in importance to taste), and these smaller companies differentiate themselves from one another in how the beans are roasted (generally lighter than Starbucks or Peet’s who roast darker to get a consistent flavor for its customer base, which also happens to take away some of the coffee’s flavor nuances). Azahar goes beyond Fair Trade and doesn't price themselves on international prices but instead qualifies the coffee, compensating for various levels of premiums, and pays above Fair Trade prices. In addition, farmers are not required to be a part of a co-operative to work with them, as they are with Fair Trade companies. Plus, for each bag of coffee that is exported, a portion of the proceeds gets redistributed to the farmer in the form of a dividend. It's a way of having the farmer participate in the final sale of the coffee. Keith Schuman, Co-Founder of Azahar, with whom Wendy Goodfriend and I recently met for a cupping, puts it as: "Literally, it's the farmer, it's Azahar, it's the consumer." At Azahar, everything is done at the source. The beans are harvested, hulled and hand-selected, then “roasted to fit” in Colombia. It is then shipped to the United States. How fresh is the coffee? Well, when Wendy and I met with Keith from Azahar, he brought a bag of coffee that was harvested three weeks before and roasted just four days before, all in Colombia. Can’t get much fresher than that. Azahar’s focus on quality and freshness is combined with a sustainable business practice (economic, social, and environmental) that also happens to be incredibly beneficial to the farmers with whom they work. 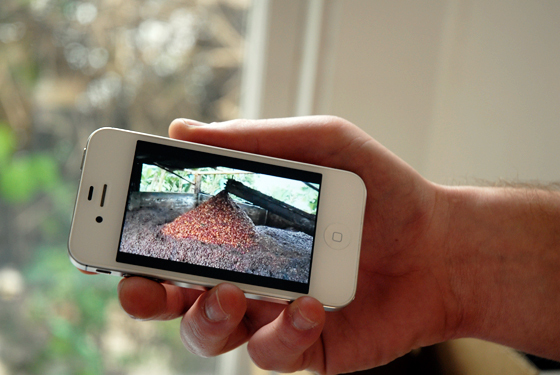 Coffee is treated like a commodity throughout the entire supply chain. Even specialty coffee roasters go through a very convoluted supply chain. The farmers sell their coffee—even if they negotiate it with roasters—they still sell it to the cooperative. The cooperative sells it to a dry mill. The mill works with an exporter who sells it to a broker. And through the broker, it goes to an importer. And the importer gets it to the roasters. We have eliminated the entire intermediary supply chain, because we’re at origin. We work directly with our farmers, [even] providing technical assistance from an agronomic standpoint. We buy our coffee directly from the farmers. In Colombia, it comes to our mill. We maintain all the processes in house. There is a huge focus on social responsibility at Azahar. The company has even created its own program (stemming from a program that predated them but became defunct due to lack of funding) which employs 10 women from La Tebaida, near Armenia, Quindío, Colombia a nearby town to their roasting works. Keith explains, “Armenia, Quindío has the second highest rate of unemployment in Colombia. The city has experienced economic hardship since an earthquake hit the city in the late 1990's. The damage was extensive and many companies relocated, leaving the city with a shortage of jobs. Social pressures that women face, especially those with children, make it even more challenging to find meaningful work.” The 10 women Azahar employs have gone through extensive training, learning not only about sorting coffee, but also the effect that various defects have on the quality in the cup. True to Azahar’s pride in their rare coffees and fairness to their farmers, they even color-code each bag according to region, then label it with the name of the municipality, the Vereda, the Altitude, the Varietals, and the flavor profile. In addition, they add a QR code to each bag that brings you to a video of the farm from which it came. I encourage you to watch these videos, which are truly enlightening. You really can’t get much more personal with Azahar’s coffee or with the process of growing coffee in general than this -- unless you straight up fly to Colombia. 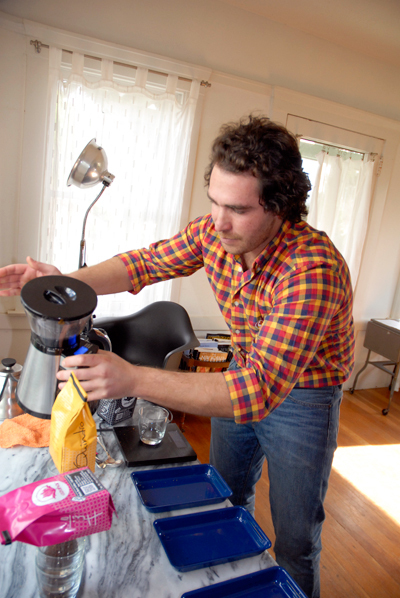 Keith uses a burr grinder to grind the coffee. A burr grinder is preferable to a blade grinder because it crushes the coffee. Blade grinders cut the beans unevenly leading to inconsistent brewing and heat creation which can lead to a burnt taste. Burr grinders create more consistent grounds and release the oils in the beans, making for a richer and smoother brew. 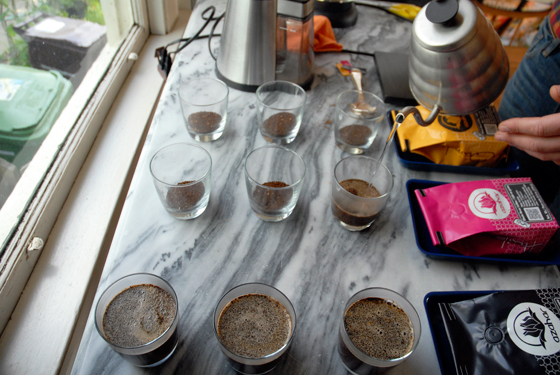 Three cups are used for each lot for uniformity throughout the process. Beans used for cupping are roasted very lightly so that the grounds are not too soluble [coffee has a defined solubility of 26% of grounds soluble in water]. Professional cupping, which is also done to analyze weight loss and humidity, as well as identify defects, is done blindly and lots are numbered, so that there is no subconscious bias during the process. Azahar cups in accordance with the Specialty Coffee Association of America (SCAA), the governing body for quality control for specialty coffee, in conjunction with SCAA’s charitable trust, the Coffee Quality Institute (CQI). 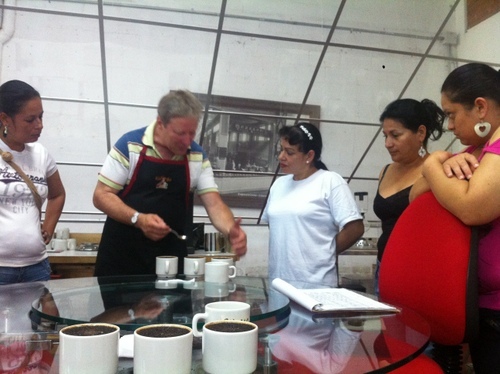 Keith explains CQI’s Q Coffee System, a certification system for cupping where coffees receive points like wine. Q Scores also establish a common language. 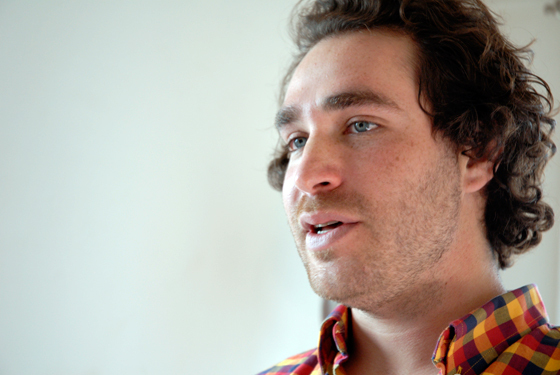 He explains, “If accounting is the language of business, cupping is the language of coffee. So I can talk to somebody in Japan and say ‘this coffee cupped at…” and they know within a reasonable margin of difference that it’s of a certain quality. Cupping is trying to standardize the process.” Any coffee that cups over an 80 (out of 100) is considered a specialty grade coffee. 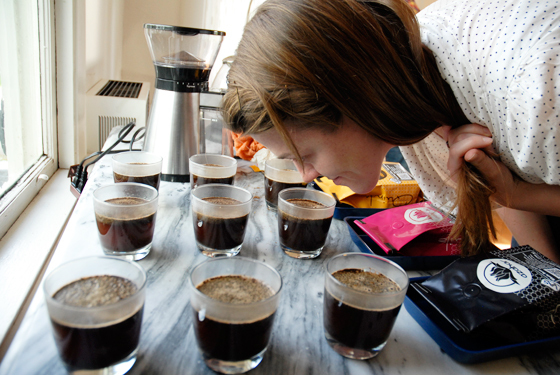 Coffees scoring 84 or higher are eligible to compete in the SCAA’s Coffees of the Year Competition. The overwhelming majority of coffees cup below 80. Azahar only uses coffees cupping over 85, with many cupping over 90. We’re doing a very remedial cupping here, just to get a feel for the process, so Keith has lined the bags up next to each set of cups. However we don’t look at the flavor profiles on the bag, so we can make up own minds about flavors and aromas. 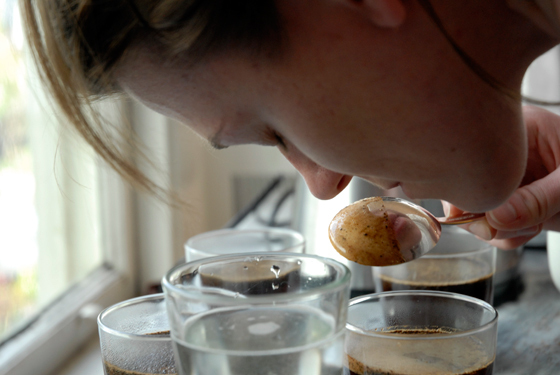 Keith begins the “fragrance” part of the cupping and very carefully measures 8 grams of ground coffee into each cup. Bits of yellow speckle the dark grounds -- it’s the chaff in the bean which has not burned off due to the light roasting. We have 15-30 seconds before the aromatics of the coffee starts to “escape.” We swish the coffee grounds in each cup before we smell them, flaring our nostrils to pick up the most aromatics possible. At first, with my untrained nose, I think to myself, “Ummm, it smells like coffee” But then I try to close my eyes and focus, and eventually pick up fruity notes, earthy notes, chocolatey notes. He explains that the more you do this the more adept you become at identifying aromatics, including subtle or more complicated aromas like jasmine, rose, or cinnamon, or picking up on complex finishes. Juan Vélez, Director of Quality Control and Co-Founder Tyler Youngblood, who are on location in Colombia (and who gave us a virtual tour of the facility via Skype! ), cup every single day, for example. 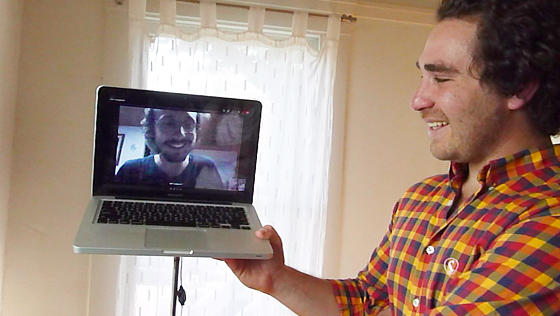 Co-Founder Tyler Youngblood gives us a virtual tour, via Skype, of the Azahar facility in Colombia. Per coffee cupping etiquette, Wendy and I keep our opinions to ourselves, so as not to influence each other, and then discuss afterwards. I feel proud when I pick up a caramel note! Soon it becomes really fun, as we compare our experiences. After the “fragrance” part of the cupping, Keith adds hot water (at near boiling temperature) to the grounds for the “aroma” part. We smell again without disturbing it and get entirely new notes. We watch the bubbles rise to the top as the coffee degasifies and the last of the CO2 leaves the grounds. Oil-rich crema forms on top. After we wait a little, we “break the crust” by “cracking” through the top layer with a silver cupping spoon, and smell the back of the spoon. Ever eloquent, I say to Keith "I feel like it brings up different stuff." But I think that pretty much sums up the experience. Every step pulls out new aromas. Next we skim the grounds and froth off the top. We eat a piece of banana then sip some water to cleanse our palates. 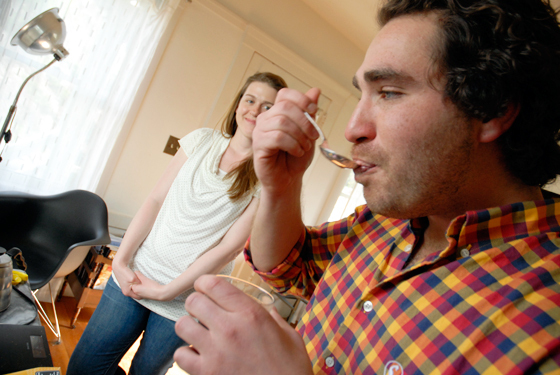 We take a spoonful of coffee and slurp it loud and fast to cover the most surface area in our mouths. Then, like with wine, you're supposed to spit it back out. We realize we forgot to get a spittoon, so we just end up swallowing, accepting that we'll just be a little over-caffeinated for the rest of the day. 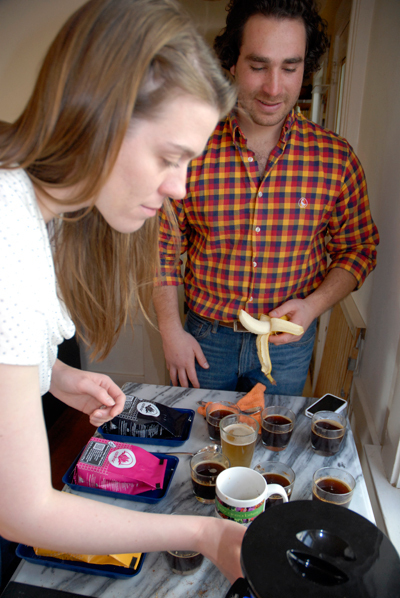 We compare our experiences, this time comparing our impressions with the bags that list the flavor profiles. That's when I realize that it is all about practice, just as Keith says. Yes, I do taste that oak. But my untrained brain wouldn't make that association without the prompt. Practice builds the language for you to be able to not just identify a flavor or aroma, but to also label it. 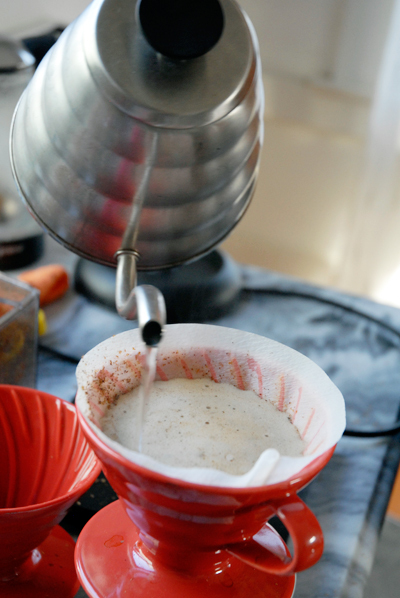 In a pour-over, water is poured from a special pouring kettle onto coffee grounds in a ceramic drip device lined with a cone filter, straight into the coffee cup. It has the feel of a ritual. An intimate method of extracting fresh flavors and aromas from the grounds, well beyond just filling the water tank of your drip machine and pushing a button. The taste is brighter and pops more. 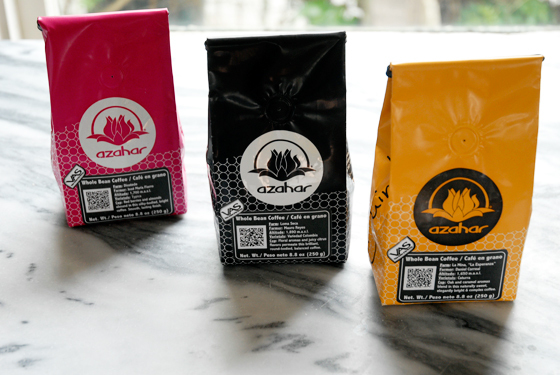 Flavors are distinctive and you truly taste a difference between each bag of Azahar's fresh coffee. There is no need for cream or soy milk. You experience the coffee for its uniqueness, not just in taste, but in its origin, its history, all the care that has gone into it to that point where you take your long awaited and delicious first sip. Azahar has been kind enough to offer our readers a discount on their coffee when ordered through their website. Use the code "Bay Area Bites" on any order and you'll get 15% off!